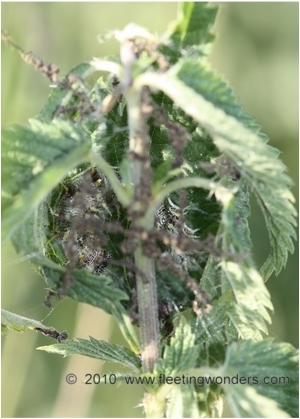 A caterpillar of Red Admiral (Vanessa atalanta) was found on Nettle (Urtica dioica) on the 27th of August, 2009 (Franche-Comté, France). As usual in this species it had built an harbor with leaves and silk. On the 16th of September, all my hopes collapsed when checking the chrysalis... A great hole was seen in its tegument and five small black pupae were on the floor below. Some aliens had been eating my butterfly pupa from the inside ! 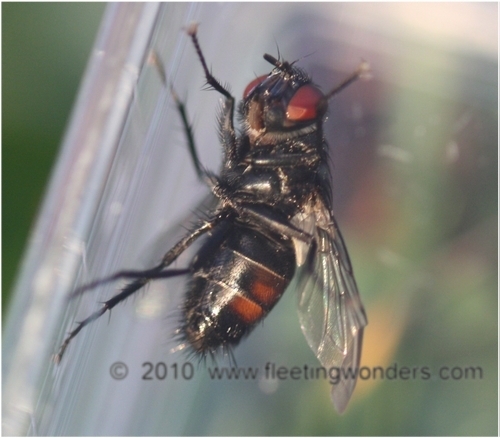 In fact some maggots of a fly species had been growing inside their host then got out of it. 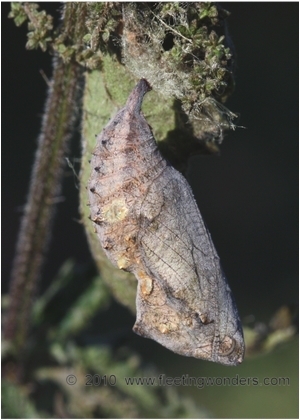 The butterfly chrysalis probably died several days after its pupation given the size of the parasites. 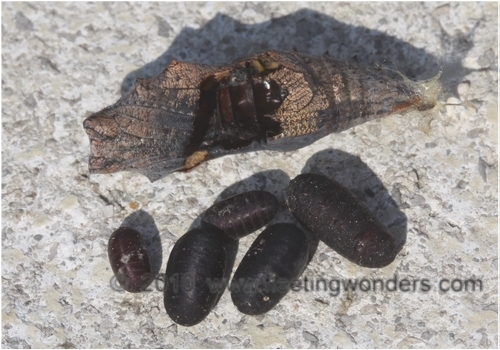 The size of the pupae was diverse, and their lenght ranged from 4mm to 9mm. 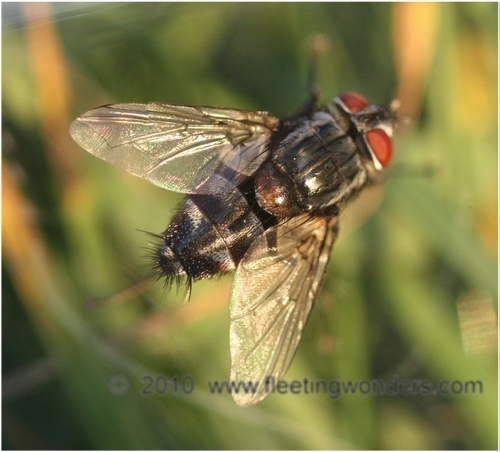 Between the 21st and the 24th of September, flies got out of the pupae. Dr Hans-Peter Tschorsnig from the Staatliches Museum für Naturkunde (Stuttgart, Germany) kindly helped me identify this Tachinid fly : Sturmia bella (Tachinidae). Its red eyes, strong hairs on the abdomen with orange markings are typical of this widespread species. When swallowed, the eggs hatch within the caterpillar giving some tiny larvae that migrate to non-vital body tissues of the host (such as fat). These small maggots manage to resist to the immune system of the host and do not get killed; the parasites even do not prevent the caterpillar from living, eating, having its natural behavior, pupating... No deadly damage caused to the host until the end of the parasite growing, then the host gets killed anyway. This is a very sophisticated kind of host-parasite relationship. Sturmia bella is not host-specific to a butterfly, but is the main parasite for butterflies of genus Inachis, Aglais, Vanessa... and many other butterfly species in nature.